Nels Sonju, Norwegian immigrant, was part of the "Viking" contingent to represent the community of Poulsbo, Washington in the Norway Day parade at the 1909 Alaska Yukon Pacific Exposition (AYPE) in Seattle. See the explanatory blog entry for this series: Poulsbo Vikings at the Alaska Yukon Pacific Exposition, 1909. Poulsbo: Its First Hundred Years). 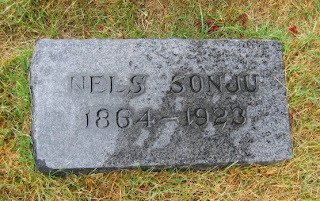 I first became interested in Nels Sonju (1864-1923), a Norwegian-American businessman, entrepreneur, and adventurer, while searching for information about one of his daughters. I learned that the Sonju family from Poulsbo, Washington came from a Norwegian background, and discovered Sonju's activities relating to the AYPE. 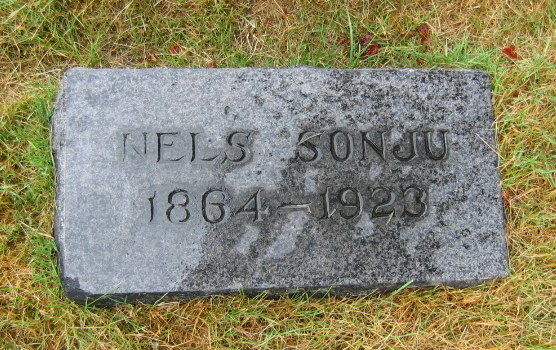 Nels Sonju immigrated from Norway in 1879, first residing in Bayfield, Wisconsin, and then Troy, Wisconsin. He married Petra A. Soli in Pierce County, Wisconsin, on March 20, 1884. The couple had four children: Annie M., born in about 1897, in Wisconsin; Sarah, born on April 6, 1891, at Washburn, Bayfield, Wisconsin; Howard Melvin, born on January 1, 1898, also at Washburn; and Norman Rudolph, born on June 6, 1902, at Hudson, St. Croix, Wisconsin. 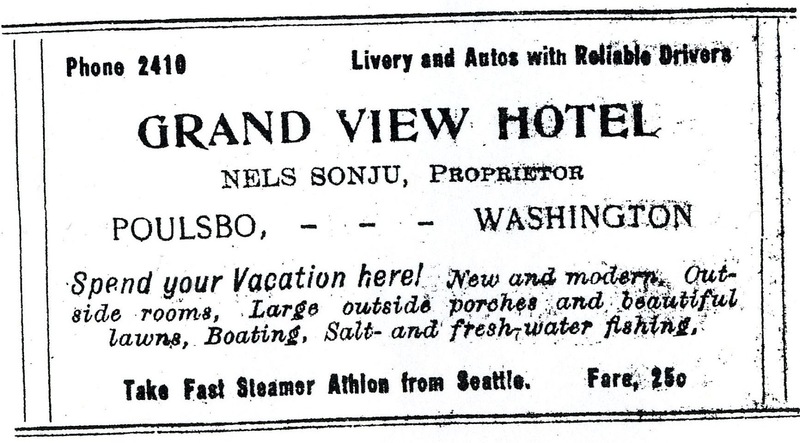 Several years before the 1909 AYPE, Nels and Petra Sonju moved their family to the Seattle area in Washington State, accompanied by other family members from the Bayfield, Wisconsin area. 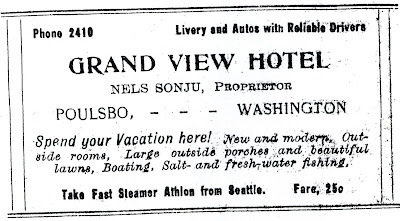 Nels Sonju built the Grand View Hotel along the Poulsbo waterfront, which served as the main source of income for his family. He maintained a horse drawn taxi service as a sideline, and starting in 1918, operated an auto taxi service, the Vinland-Poulsbo mail and stage line. He brought the mail from the steamer in Poulsbo to the post office in Vinland, and then transported passengers, mail, and freight back to Poulsbo. The Grand View Hotel was torn down in about 1970 in order to provide a site for the new Sons of Norway Grieg Hall. As an individual who was interested in the development of his community, Sonju served as a director for the area's first telephone company, the Poulsbo Rural Telephone Company, incorporated in 1907. Along with the other original stockholders, Sonju was responsible for the maintenance and line work. He was also a charter member of the Poulsbo Lodge #44, Sons of Norway, organized in 1916. The stated objective of the order was to foster and promote "all that is good in the Norwegian heritage." 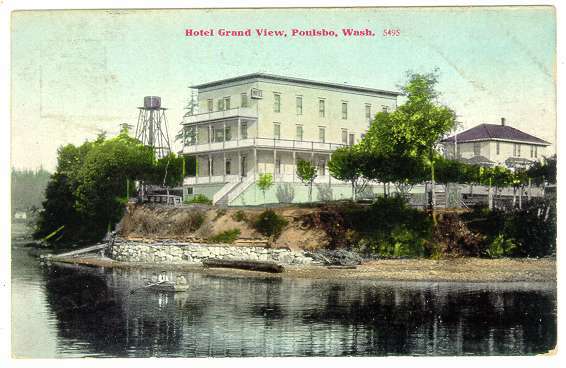 Old postcard of the Grand View Hotel in Poulsbo, ca. 1910. Advertisement from the front page of the Kitsap County Herald, April 12, 1918. Nels Sonju had other adventures. He figured prominently in George C. Teien's recounting of his Klondike adventures in the Teien Tales: I Enter the Alaska Fur Trade. The Sonjus' second daughter, Sarah, worked as a color artist for various Seattle photographers, including well-known Asahel Curtis. Curtis was known for documenting Washington's natural resources and related industries, as well as early historic events. While working at the Curtis studio, Sarah met Lawrence Denny Lindsley, nature photographer and grandson of Seattle founding pioneers David and Louisa Denny. At age 53, Sarah married Lindsley in 1944. Norman Sonju, youngest son of Nels and Petra, made a name for himself on the rowing team at the University of Washington, where he attended in the late 1920s. Norman studied business administration, and was also a member of Sigma Phy Epsilon fraternity, the Oval Club, Varsity Boat Club, and Captain Crew. As a graduating senior, he was a student assistant to Coach Rusty Callow. After graduation, he then served on the faculty for a couple of years, and coached the crew at Cornell University from 1936-1946. He found national recognition as a rowing coach for the University of Wisconsin, and for his career success at home and at an Olympic meet in London. After his retirement in 1946, Norman Sonju returned to the Poulsbo, Washington, where he had spent his childhood years. After Nels Sonju died in 1923, his widow, Petra, moved to Seattle and lived at 1625 E. Madison while their youngest son, Norman, attended the University of Washington. By 1932, she was living with her daughter, Sarah, a photography color artist, at 6553 Palatine Avenue. Petra Sonju passed away on August 6, 1943, at the age of eighty. --Driscoll, Judy and Sherry White. Poulsbo, Images of America Series (Arcadia Publishing: Charleston, South Carolina, 2013). --Evergreen/Washelli Cemetery Records; Seattle, Washington. 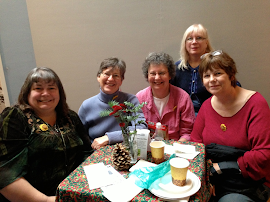 --Kitsap County Historical Society Book Committee. Kitsap County History. Kitsap County Historical Society: Seattle, Washington, 1977). --Rangvald Kvelstad. Poulsbo: Its First Hundred Years (Poulsbo Centennial Book Committee: Silverton, Washington, 1986).